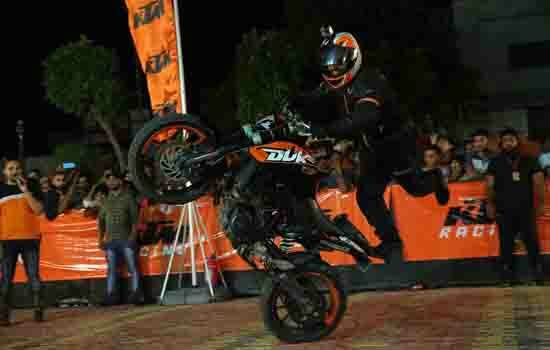 Bhilwara : KTM, the European Racing Legend, conducted breath-taking KTMStunt show in Bhilwara.The Stunt-show was organized in order to showcase the mind-blowing stunt rides and tricks from the professional stunt riders. The Stunt show was held inSurya Mahal, Shastri Nagar, Bhilwara.The professional stunt team demonstrated breath-taking stunts on the KTM Duke bikes. The event was open to all and the spectacular stuntstook the city by a storm. Till now, KTM Stunt show has been organized atSurat,Rajkot, Ahmedabad, Coimbatore, Chennai, Lucknow, Indore, Jabalpur, Aurangabad, Jammu, Jalandhar, Jodhpur, Salem, Vellore, Udaipur, Kota, Jaipur, Alwar, Bikaner, Ajmer and many other towns. KTM fans can buy the range of KTM bikes fromMadhav Nagar, Near Ansal API, Ajmer Road, Bhilwara, Rajasthan.